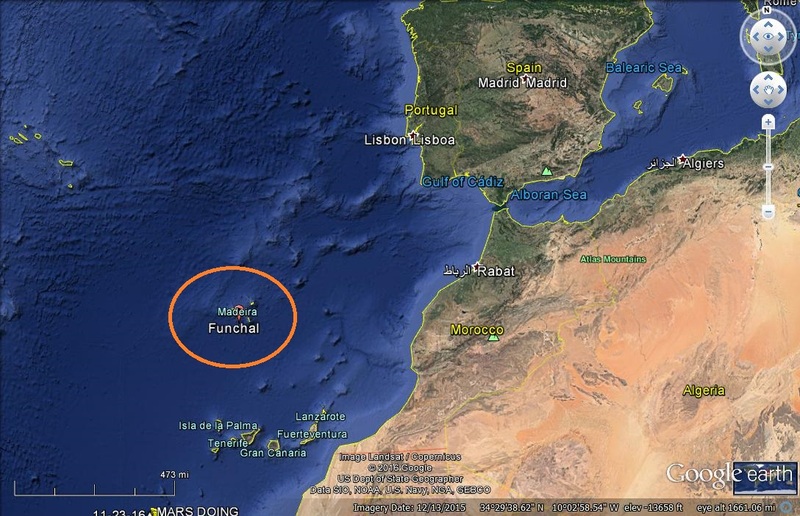 Madeira island is located about 500 miles west of Morocco. 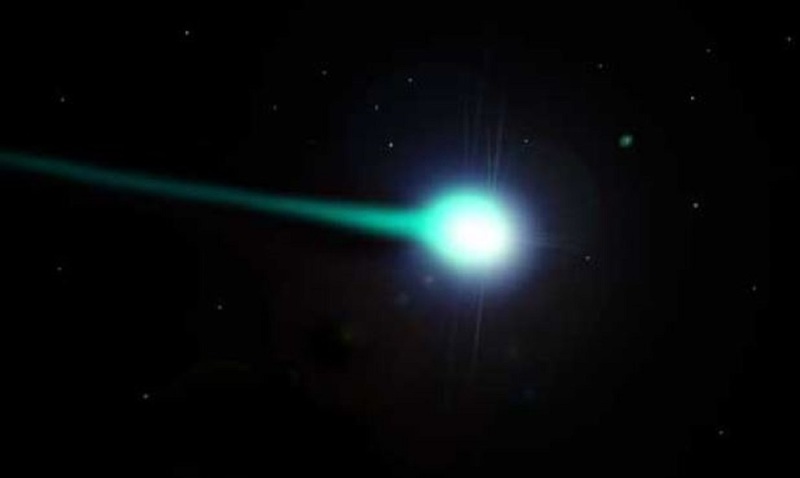 On May 22 nd 2008 at about 21.57 pm local time my wife and I witnessed a strange light which at first I thought was an extremely bright star. I had just walked out onto our balcony, I then realized that it was moving in relation to the stars in the sky .I then thought it must be a shooting star and expected it crash in to the atmosphere ,which did not occur. By this time my wife got the camera and managed to take two pictures before it disappeared from view over the apartment, heading northeast almost directly above us. The sighting lasted about 3 minutes. Unfortunately we are not great photographers, the images are not great but left us quite surprised and confused at what they revealed . 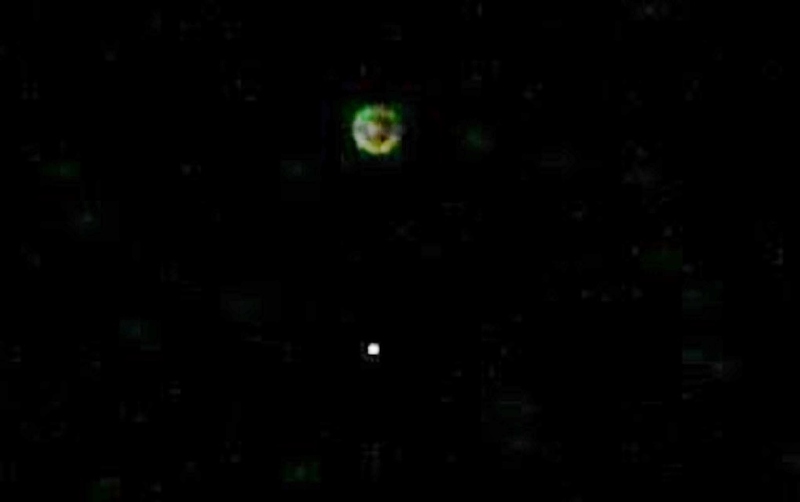 In them both appears a star and the object, they were taken a few seconds apart. 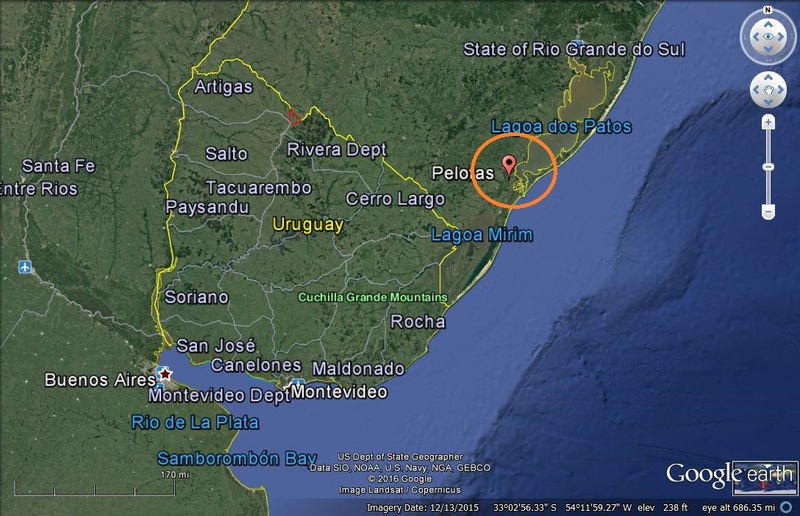 This case is under investigation by International Director of Portugal Ken Pfeifer. ARMY TEAM’S CLOSE ENCOUNTER IN IRAQ. I was with an US Army infantry team in Southern Iraq at the time. We were on mission, sitting stationary in 3 humvees near the Iraq/Iran border, watching for mortar fire. After about 30 minutes of sitting in place in total blackout, the lead humvee gunner, Specialist Henry Merrill spotted one glowing, pulsating circular object hovering close to a mile away at about 45 degrees from horizon. The object then began to sway, almost like a slow dance before it started to seperate into dozens of different but similar objects. All objects continued to sway in unison as the seperation continued to fill the sky over a period of 30 minutes. Rhe movements were all similar, literally had the feeling of an aerial slow dance. Moving closer amd further away, spinning, almost seeming to change shape, all simultaneously. The objects then stopped, rapidly got in-line back to the 45 degree inclination before descending below the horizon. When I first noticed the object my first thought was that it was either a star or a distant helicopter. That thought only lasted about a minute before I realized it was neither based on the movement and the fact that the objects were ONLY visible through infrared. At first I felt worried that nobody knew what the original aircraft was. Once it started seperating, I became less worried the object was hostile and just became puzzled. The feeling of worry was rekindled when the objects got in line because this was so different from the previous movements and seemed almost hostile, like an attack formation. Once the objects descended, we all decided to end the mission early and RTB. NOTE: The above image is CGI. Carlos took off, nevertheless, at 10:30, without having his breakfast. He climbed his little plane to 13,500 feet but conditions were still bad so he climbed to 14,500 where he found a clear blue sky and continued on his return trip to Mexico City. Arriving in the area of Tequesquitengo, Carlos decided to lose altitude in order to make visual contact with Lake Tequesquitengo and verify his position, instead of depending on his instruments. When he got down underneath the cloud cover, ground mist and fog blocked his view of the Lake. Then things began to happen. When he looked from the left (he had been gazing through his left side window) to the front he became aware of something on his right and glanced in that direction and was shocked to see an object with the appearance of two plates joined together at the rim with a cupola which had what seemed to be a little window and an antenna on top. It was positioned 20 centimeters above the surface of the wing and about 1 1/2 meters from the Piper’s cabin. (See drawing by Staff Artist Robert Gonzales.) A glance back to the left revealed another object of the same description in the same position above the left wing. Mexico City: Come in, extra bravo extra alfa union. (Here the pilot repeated his call twice — apparently he did not hear Mexico City answer.) Center Mexico here, come in extra alfa union. Carlos: Extra alfa union to Center Mexico. My aircraft is out of control — I have no control over it — I have three unidentified objects flying around me. I have three unidentified objects flying around me, one came under my aircraft and hit it. The landing gear is locked in and the controls won’t release them. My position — I am on the Radial 004 from the VOR Tequesquitengo — I am not controlling the plane — Center Mexico, can you hear me? Carlos: The aircraft is out of control. At this point, Mexico City International Airport closed its runways to traffic and prepared for the expected emergency landing. The objects continued maintaining position on XB-XAU, exerting complete control over the aircraft. 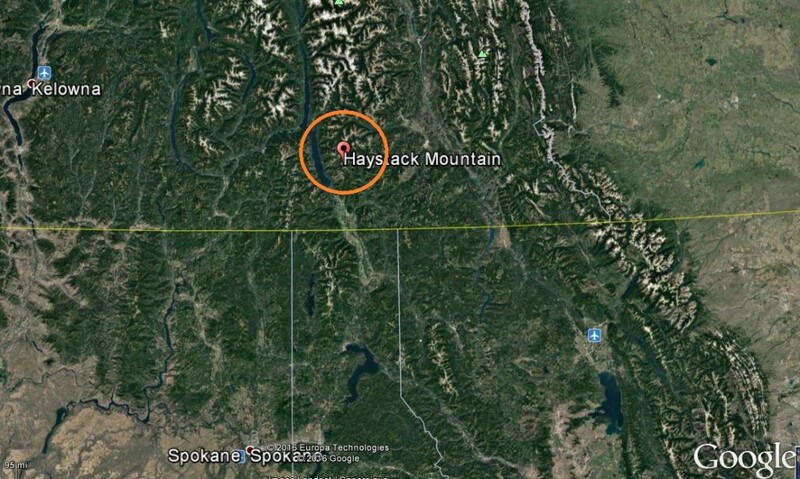 The “Mayday” or emergency call was received at 12:15 p.m. on Saturday, May 3. The control tower contacted Ignacio Silva la Mora (Carlo’s uncle), an authority on aircraft, who was put in touch with Carlos via radio to analyze the problem and help with landing preparations. 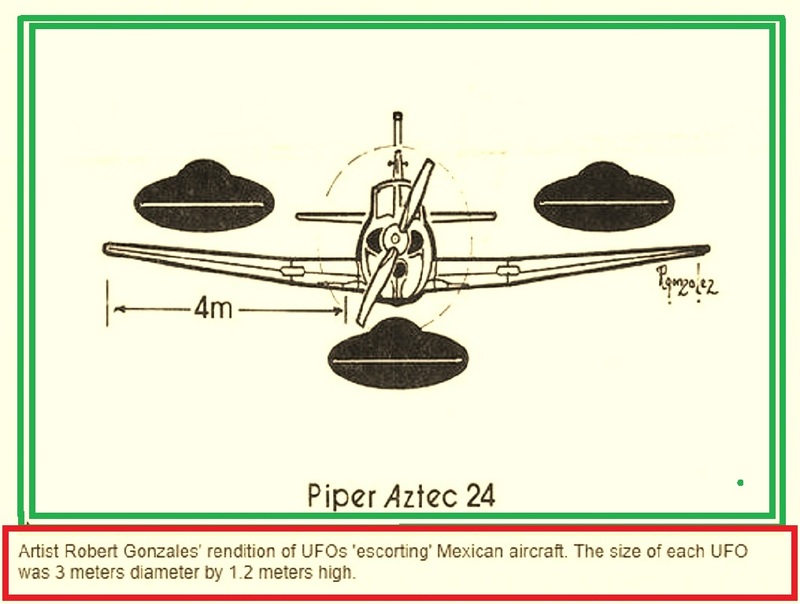 When Carlos had reached the Ajusco navigational fix, the UFOs had elevated the aircraft from 15,000 feet (the altitude while over Tequesquitengo) to 15,800 and then, one by one, they left. First the object over his left wing elevated until it was over the cabin, then above the object on the right wing, and then these two flew off and were lost to view in the direction of the Popocatepetl and Iztaccihuatal volcanoes. The controls of the aircraft were immediately normal and Carlos regained control. Carlos then attempted to lower the landing gear, circling Mexico City International Airport eight times, in radio contact to ascertain if he was successful. Finally, after 40 minutes of circling while he worked on the control column with a screw driver, he managed to lower the wheels and landed at 1:34 p.m. on the grassy area between runway 5 right and 5 left where emergency vehicles, including firemen and ambulance, were waiting. After landing, Carlos was taken to the Airport Clinic where he was thoroughly examined and found to be normal and fit. NOTE: The above image is the witness drawing. My son, his wife and I were in Bethany Beach on November 6, 2016 at 11:10am. The sky was crystal clear blue. We observed 3 military planes flying east at about 25 thousand ft. about a mile apart heading out over the Atlantic ocean with long contrails. We were talking about how clear we could see the aircraft. 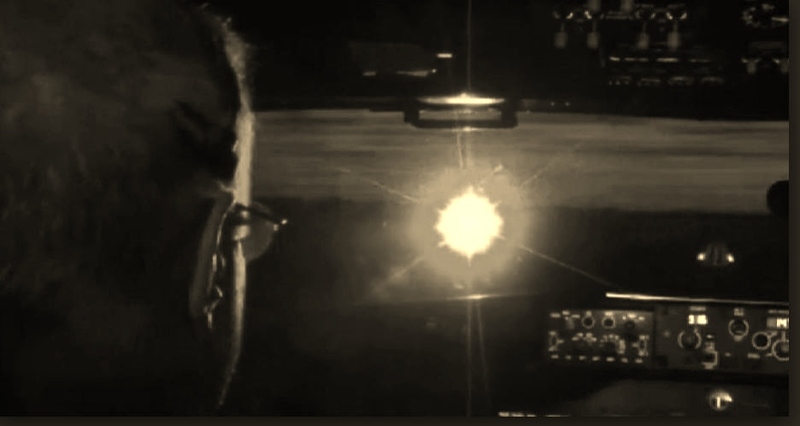 All of a sudden out of the northeast we saw a bright, silver acorn-shaped object approach the middle aircraft. 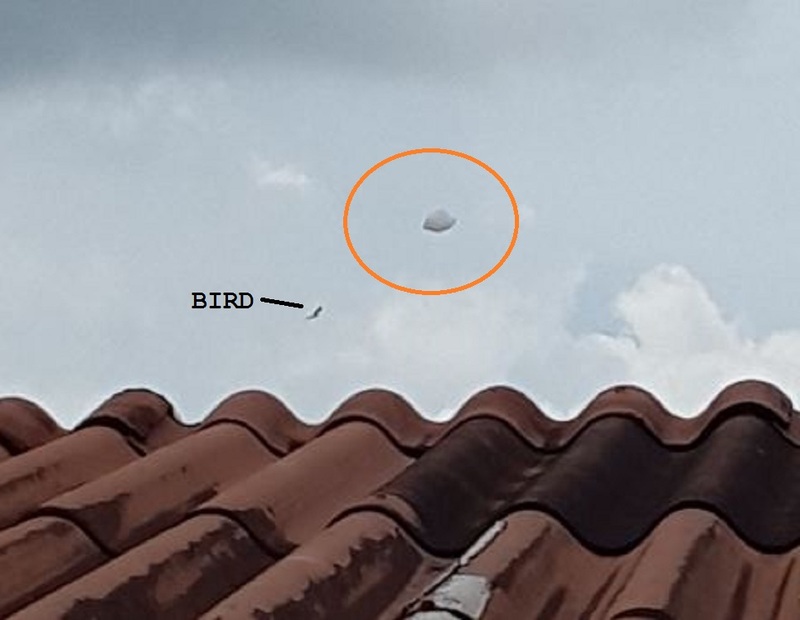 It flew over the top and at the same speed as the aircraft for about 4 seconds, then shot off at a high rate of speed to the southwest and disappeared. We looked at each other saying, “what was that?” We concluded we just saw a UFO. We were beside ourselves! We concluded we just saw a UFO. What we saw was real and very clear! I called Dover air force base. They said it wasn’t their jurisdiction and to call Philadelphia international airport. We called them. They listened and said to call Dover air force base. No one wanted to talk about it, Strange. NOTE: The above image is a rendering. The first sighting took place at 9:30 pm, the 4 objects were in the North Sky about 45 degrees above the horizon and were a quarter of the size of a five cent piece. They stopped for a period of time, then went backwards and then proceded towards the West again. At about 10:15 pm Charles and his friends saw 5 bright lights in the same position as the one’s he had seen previously. They were in a traingle formation then changed to a straight line. Charles grabbed his telescope and noted the objects looked like balls of fire and he could see what appeared to be smoke and that the objects were at cloud height. Witnesses: Pat asked around but no one else has come forward yet, she may ask the local paper to publish her story in the hope that someone else saw it. Pat, a very well spoken, educated, older lady was staying at the Discovery Beach Resort on the Sunshine Coast (used to be the old Surf Air) on Friday night, 28th January 2000. Her room overlooked the ocean and the hotel was right on the beach. At about 3.45am on Saturday Morning (29th) Pat woke up from a restless night, (Pat does have trouble sleeping) and saw a very bright light shining through the window of her room, Pat got out of bed and looked out the window and saw this light which Pat describes as 500 times that of a fluorescent light. She was looking out to the East over the ocean, Pat says there is a very small uninhabited island about half a mile out to sea from the resort called MUDJIMBA ISLAND, and the light was just above this Island about 2,000-3,000 feet up and slightly to the North of the Island. The light stayed in the same position and after about a hour. 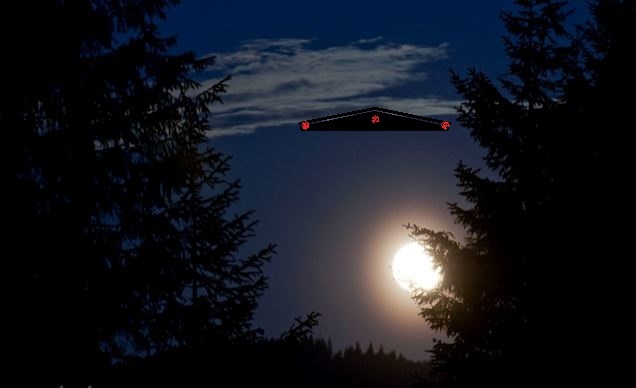 Pat noticed a shape, rectangle, with a reddish cone tail end. Then some little flashes of light came out the cone looking tail. Pat sat at the window watching this light until 5.10am when it started to move upwards and disappeared. Pat says she has never seen anything like it before, and would like to know what it was? She has never thought about UFO’s before but it has now made her think about it and want to know more. She is familiar with the stars and says it was not a star. NOTE: The above image is CGI. Sunday night , after falling asleep in his chair, Peter woke up and went Outside to feed his dogs. As it was such a nice night he decided to relax for a while and do a bit of stargazing, which he very often does late at night. 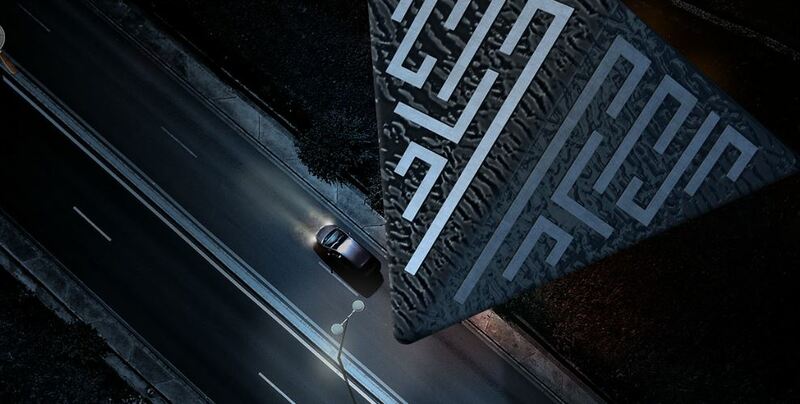 After approximately half an hour, he looked up and noticed a large, solid black V shaped object with dim orange lights which were situated along the front end of the object. Peter said it was a very clear night and he first noticed the object because it was blocking out the Big Dipper constellation he had been looking at previously. There was no sound emitted from the object at all and Peter estimates that it must have been at least 5 times bigger than a Jumbo Jet. He sighted the object for only 3-4 seconds when Peter says it just disappeared from view. 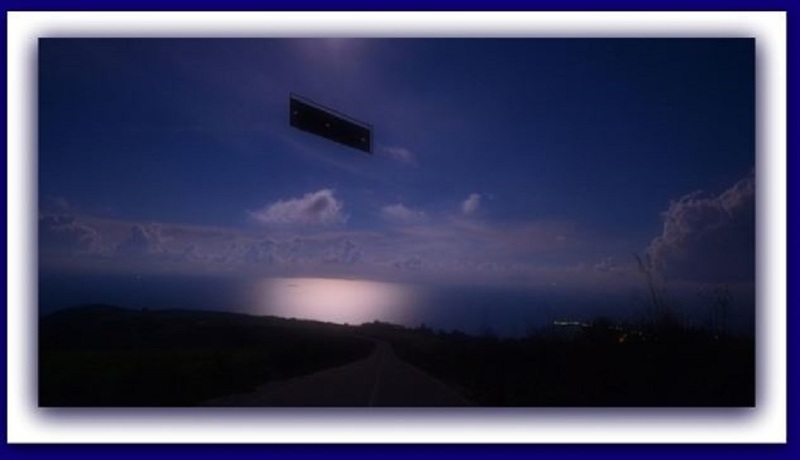 On the night of Sunday 2nd Jan 2000, Margaret who is a nurse was on her way home from work, when at approx 10.20pm, she observed a black V shaped object with 3 red lights hovering over Houses in Sky Road, Frankston. She pulled over to the side of the road and turned off the Ignition (Prior to turning off the ignition she had noticed some interference on the car radio). She said the object was very big and no sound came from it, what so ever. It was a very clear night. And although it wasn’t hot at all that night, Margaret had a feeling of the car and then herself becoming very hot. She watched the object for a few minutes when it suddenly disappeared. There were no other witnesses. Nick, saw the UFO, with 3 other men. Nick was sitting outside with 3 of his mates, when all of a sudden a bright light appeared out of nowhere in the sky. First off, Nick thought it might be the Police helicopter, and that it had turned on its search light. But, what seemed strange to Nick and made him change his mind, is that as the object got closer he could make out that it was quite large, and coloured a blue colour, not white, like the search light would be. When she asked Nick how big he thought the object looked to him, he said it was long and quite large. He said, he felt it looked like a ship and reminded him of a Star Trek like spaceship. ” It just appeared from behind a tree ! !… I sat there with my mates and we watched it travel levelly for about 15 seconds. I live near the Northfield Velladrome and it moved from West to East over to where Yatala Gaol is. The funny thing was, it all of a sudden spurted a bright coloured tail…the same sort of colour that you get with a gas flame, that colour blue. It seem to spit out the flame, which then made it move…then it again stopped…spitted once, then twice, the flame came spinning out of its end and started to move off again, then to our surprise, as we watched it just disappeared.” Charmaine spoke to Nick about how it had been said in the media that a Meteorite was reported in the night sky at the same time. “NO, NO, I know what a meteorite looks like, I’ve been interested in the night sky for some years now, since I was a young kid. My parents owned a shack down at Willunga and I know I have seen some strange things in the sky down there, in fact I would say some UFO’s. I own a telescope, (which he has had for approx. 12 weeks) and have read up on things in the night sky, so I truly believe that it was NOT a meteorite, but something else. How could a meteorite just disappeared into thin air? I should have been able to follow its path through the sky” Nick and his mates sighting lasted for approx. 15 seconds and during that time, Nick stated the object travelled on a level path. Nick is happy to be contacted again, if any further info is required. NOTE: The above image is CGI. I was sitting on the back porch of the Black’s Farm. It was dark and cold. I was cleaning rabbits on the back porch that my father had shot. I was finishing up with the rabbit when a white ball of light coming from the south of the house moved north to the back field behind the house. It as completely silent. I watched it with awe, not quite believing what I was seeing. It hovered over the far field and looked to be about the size of a Mini Cooper. It cast a glow on the wet mud in the field and then seemed to land in the field. It was simply beautiful. It looked like it was pulsing. I eventually snapped out of it. I went to get my dad. I was very excited. When we came back out, it was gone. Like it had blinked out of existence. My father did not think I saw what I knew I had seen. He told me it was probably a helicopter and not a big deal. I knew what I had seen. The next day I walked out to where I thought it landed. I went back to my house got my dad and told him he needed to come out and see what I found. We got out there and there were three circular impressions there on the ground equally spaced out and my original set of footprints going to and from the site, very muddy and then our prints going back to the site where the orb had landed. My father was surprised enough that he called the base and reported what he had found and I had seen. No one ever came to my knowledge to check the site. 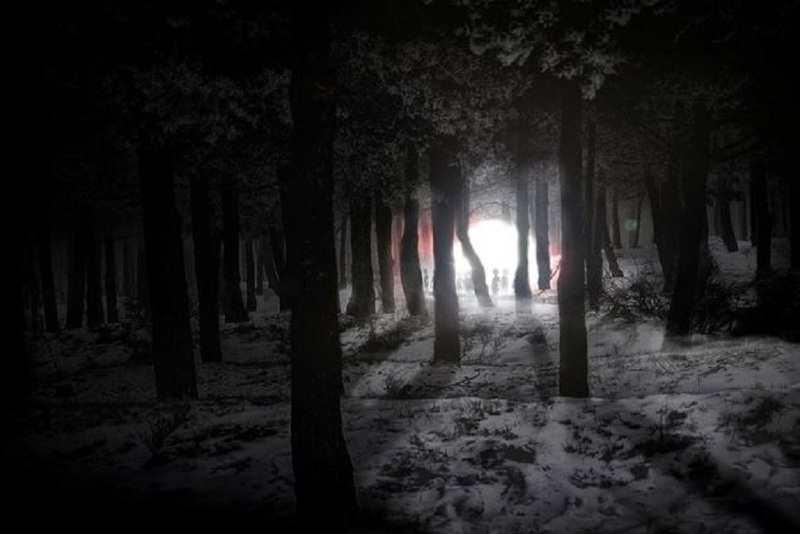 Then a couple of days later the famous Rendlesham Forest event occurred at RAF Bentwaters Woodbridge.” NOTE: The above image is CGI. Workers of a company in Lota claim having seen an extraterrestrial craft flying over the commune. These employees believe it stopped in mid-air to observe them. More than stars can be seen in the skies over Lota. Mario knows this well; he is an employee with a company located only meters from the coast, and on December 8 (2007) he had an experience that has left him in shock to this very day. “I am certain that the crew, if it had one, were aware of my presence and that I was watching them,” he recalls. It was after 10:00 pm when the worker went to greet the new shift. Around 2:10 a.m., he headed to the northern section of the facilities, and at a distance of 100 meters from the “pandereta” (brick wall) that borders the company’s perimeter, he took a casual look at the sky and saw a “machine” fly overhead. “There was a fluorescent light around it. No portholes were visible as one would see on an airplane. 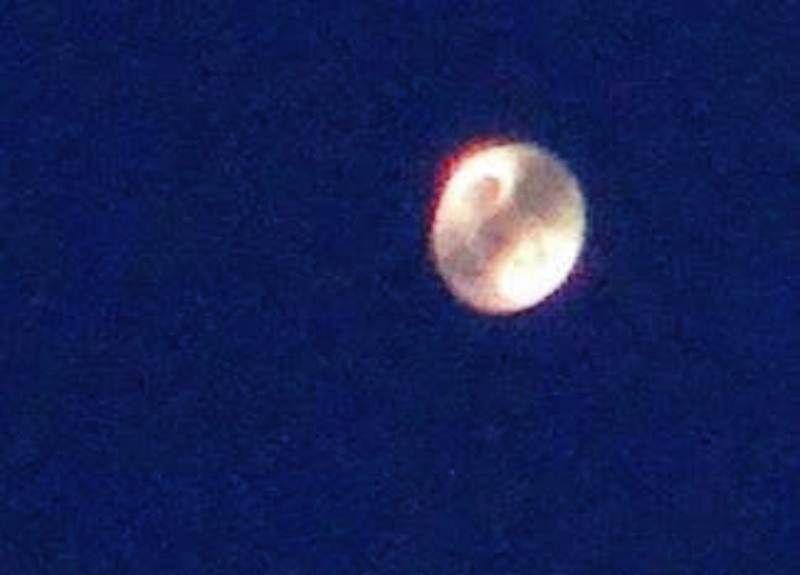 The object was dark, flat on its underside. It had an oval-shaped tail section with two lights on it. The one on the right was orange-red, and the one on the left violet. Both were intermittent, but not in sequence,” he recalls. “I have seen commercial aircraft flying over the city and in spite of their altitude; one always hears the sound of their jet engines. This was not a craft made on Earth.” In spite of the shocking experience, Mario believes himself to be among the “chosen.” “I saw that the machine was over Cerro Fundición in Lota Alto. From my perspective, it could be seen over Blocks 6 and 7 (apartment buildings). Then it made like a 90 degree turn, which puzzled me even more, because I’d never seen something in the air with these characteristics. The flying machine appeared to be patrolling the area,” he stated. 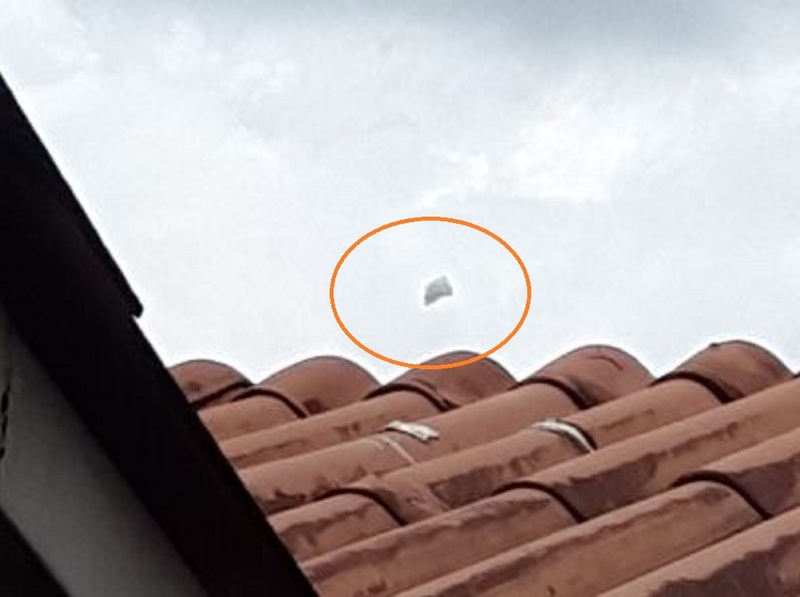 According to the witness, the object continued on its way, flying over a considerable section of Lota and then heading for the woods on the Cordilleran forest belt. The sighting lasted between 10 and 15 minutes. His friends also saw the object. What did they say about it? “They laughed at first, but then they all corroborated that what they saw wasn’t anything man-made. 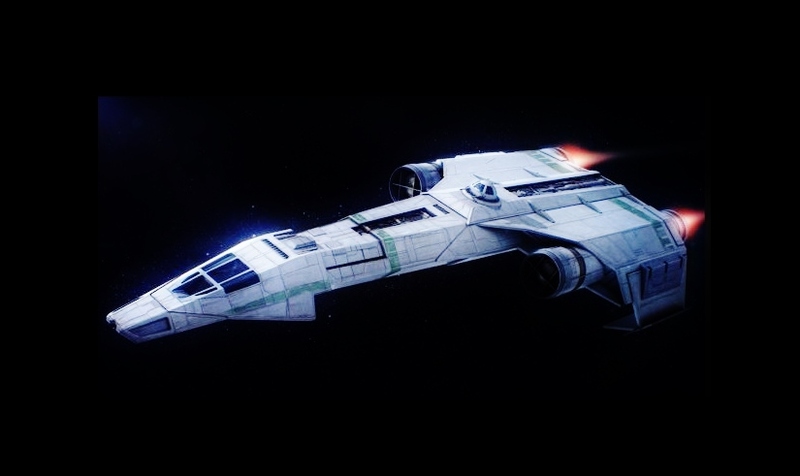 It was odd, but a co-worker said, very seriously: “I think they were among us.” NOTE: The above image is CGI. Sighting Time: 4:55 A. M.
two feet if hands out stretched. 70 to 80 feet wing span and 40 to 55 length. 15 to 20 feet tall. 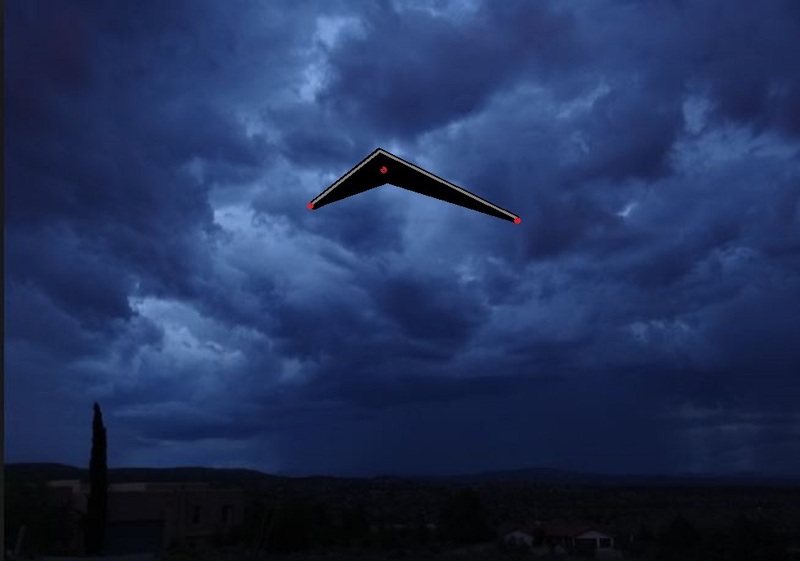 A Sinister looking thick flat black triangle with rounded edges and four large white lights under it. Flat across the bottom. No military bases or power plants but there is a uranium enrichment plant. I was going home on foot toward the north side of the city at 4:55 A.M. it was A cool clear night. When I looked up to my right and seen four large bright white lights. Since there is no tall buildings or towers in that area they stood out and the fact that they were in the shape of a triangle. 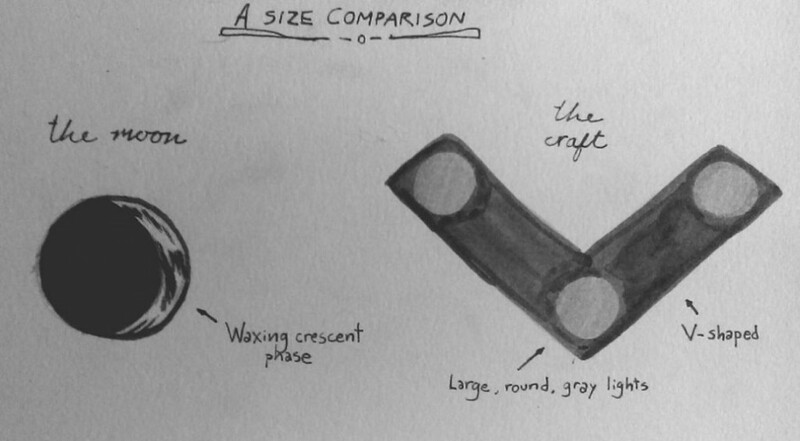 As I got closer I could see the outline of the craft that was shaped like a thick triangle was rounded off edges. under it was four large white lights. One on the front, one on each corner and one in the back that lined up with the light on the front edge. It was a flat black color like stealth aircraft have. It was not a helicopter and it did not have the pop and click of a main rotor or the shape of a helicopter. It had no Nav lights of green or red. It made no noise until I got closer I heard a very low rumble that seemed to be behind and higher up then the aircraft. As the craft moved I heard no noise. It headed southwest low at A slow speed. Before I was no sure but I tried to keep A open mind. Now I believe there is something out there I seen it with my own eyes! I love to read and knew of UFOs but never really studied them. I am not sure what to say but I would gladly take A polygraph test if that is what is needed. I seen this craft and I will not deny it to anyone it is very real. NOTE: The above image is CGI. 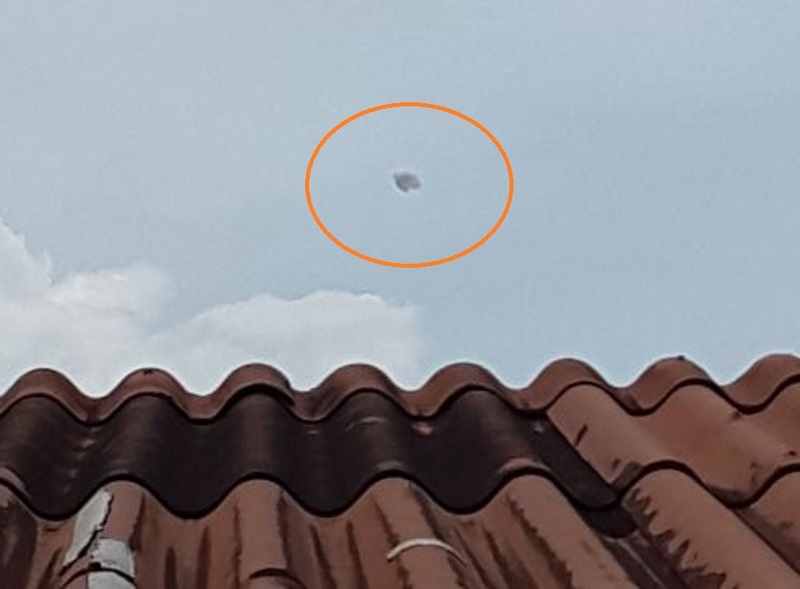 An unidentified flying object was apparently spotted 1,000 feet (about 300m) above a plane before it was seen hurtling towards earth on Monday night, the National Sea Rescue Institute (NSRI) said on Tuesday. 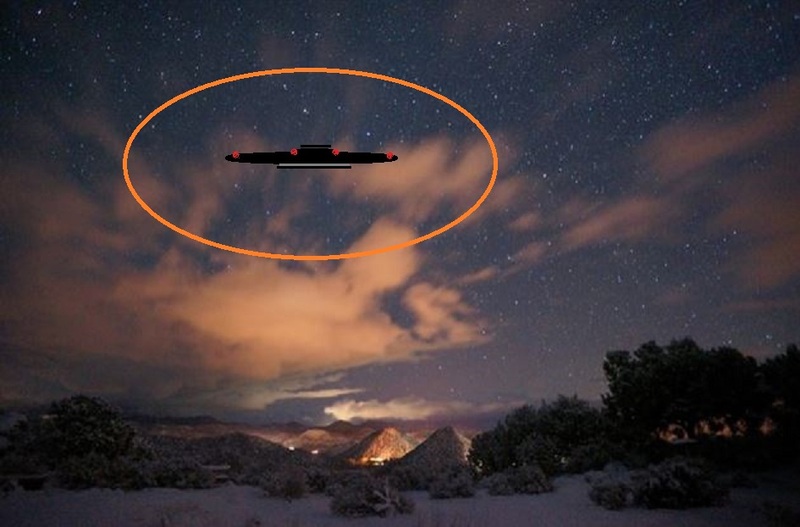 The UFO was spotted around 21:30 on Monday. 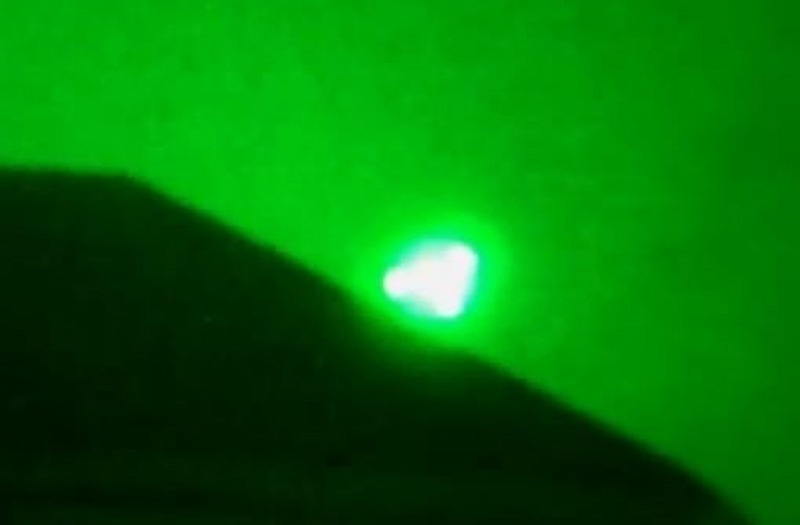 “A Boeing 737 cargo aircraft captain and co-pilot, flying from Cape Town International Airport to Port Elizabeth International Airport, reported seeing what appeared to be a green object increasing in altitude past the cockpit of their aeroplane, reaching to about a thousand feet into clouds above them, and then returning towards earth at high speed past the cockpit of the aeroplane,” NSRI spokesperson Craig Lambinon said. “The sighting was reported to air traffic control at Port Elizabeth International Airport who requested NSRI’s assistance to investigate the possibility that an aircraft or craft may be in difficulty.” Lambinon said the NSRI’s Jeffreys Bay team monitored the matter throughout the night. “The green object has not been seen since and there are no reports of anyone, or craft or aircraft overdue or missing.” Lambinon said the incident happened about 10 nautical miles off the Jeffreys Bay shore. NOTE: The above image is CGI. Description: Fast-moving craft with gray lights over suburban Huntington Beach. Description: “I’d just stepped out of my friend’s house after a comedic session of Dungeons & Dragons. We’d watched TV, talked about video games, the usual for our age group. A normal Sunday night. I was the last one to leave. 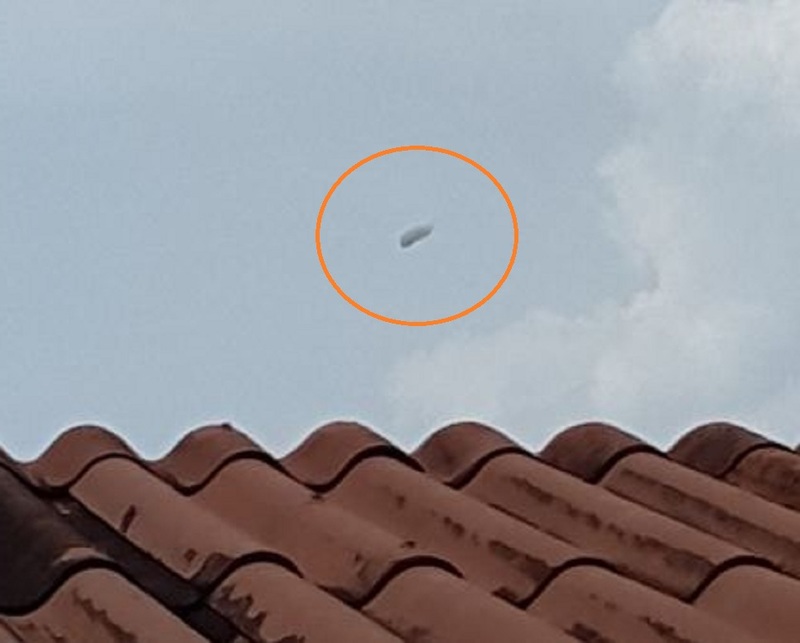 I didn’t expect to see something in the sky, but then again, I don’t think anyone does. It was one of those rare cloudless nights where LA’s famous light pollution doesn’t ruin a decent view of the stars over the suburbs. I’m originally from a very small town, so I don’t take celestial beauty for granted. I looked up at the sky to admire the stars, and that’s when I saw it. My first thought was “airplane”, but this was immediately replaced by “drone?” because it was too fast for a commercial flight, and completely silent. And then I thought that it couldn’t have been a drone, because again, it was completely silent, and the most common drones are quadcopters. This thing was in the shape of a chevron, and dark gray. It was a little larger than the moon, which was slightly farther away. Another thing that perplexed me besides the speed were the lights. Three of them, one on each wing end and one under the middle corner, unblinking, and a dim gray. I’ve never seen gray lights in my life. The chevron was headed southeast, when suddenly, without slowing down, it made a sharp, tight U-turn, pivoted, and disappeared before my eyes. I didn’t blink, I didn’t look away for a second, and there were no clouds for it to hide behind. It was there, and then it was gone. I don’t think we have the technology to make planes turn the way this thing did.” NOTE: The above image is the witness drawing. I was smoking a cigarette in a location off of rt. 70 in Marlton, NJ. I heard what sounded like a military helicopter in the distance, so I moved to get a clear view of the sky because I wanted to see it. It sounded extremely close and I could feel the power, vibrations, ETC. So finally It comes into view and it was hard to make out. There was a red orb in the front, with the chopper in the back. At first I though it may be top secret military craft with cloaking or reflection or something of the sort. 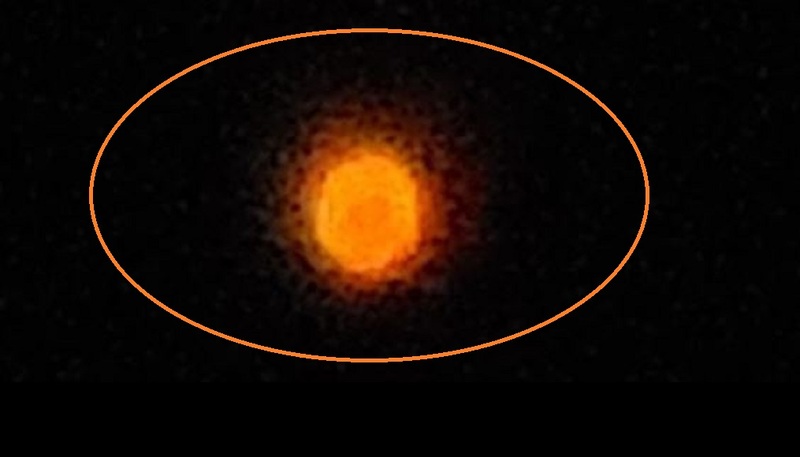 It was hard to make out in the night sky it being a black helicopter and all, but when I focused in on it I could make out a red/orange orb shape which looked like it was glowing, producing and aura, and the helicopter behind it maybe between 300-500 ft. It was hard to make out and get a grasp with surroundings because it all happened so fast. They were both flying in a straight path at what appeared to be high speeds. I had to run around the corner to keep eye sight until it went over the tree line out of sight. I had no means of following it and wouldn’t have been able to with the speed and direction it was going , having to follow traffic laws and everything. Right after my father walked out the door because he heard the chopper from inside the house and came to check it out and also had to grab something out of the car. When he was trying to lock it, he hit the lock button at least 3x and the car was still unlocked, so I’m unsure if it messed with the electrical system or whatever category you would place this in. Take note that he’s not the best with newer technology though. So I came on here to check if anybody else had reported it. 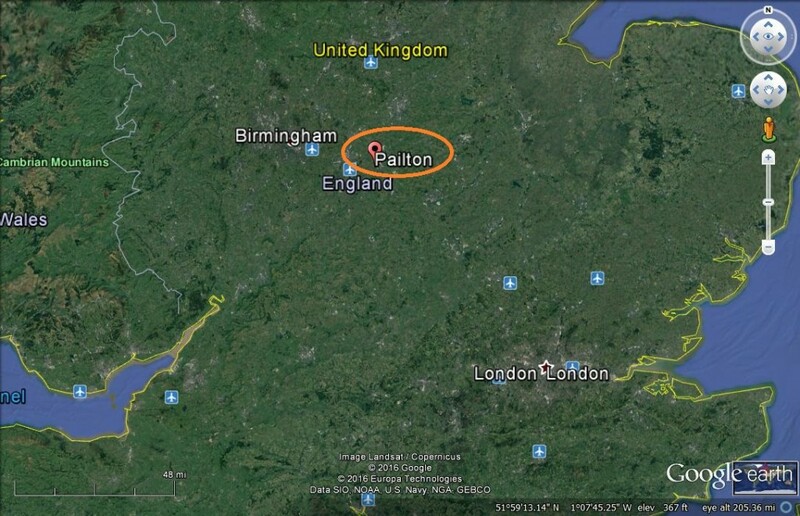 Also take note there is military bases in the area. Fort Dix and Maguire AFB. I didn’t see any reports so I figured if I would. This is not the first time I’ve seen activity of this sort in my 20+ years in this area. One was 10+ years ago, and one was over this past summer. I made no reports of them or checked for any. NOTE: The above image is CGI.